A unique gift for any special celebration, this Blissful Fathers Day Special Gift Basket welcomes the happy feelings into the lives of the people you love. 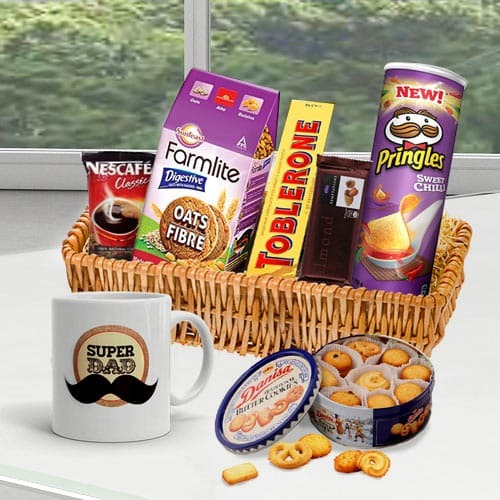 This delightful Gift Basket is perfect to show a loved one you care as it is presented with 1 Imported Danish Cookies, 1 Cadbury Temptations Almond (80 gm), 1 Toblerone (50 gm), 1 Pringle Chips, 1 Dad Coffee Mug, 1 Oats Digestive Biscuit and 1 Pouch Nescafe of Rs.20. All these come elegantly coordinated in a cane Basket.